Bariatric patients will require a higher level of support than standard mattresses can provide, and this is especially true if they are at risk of pressure sores. The Sidhil Acclaim Bariatric VE Foam Pressure Relief Mattress is designed for these patients, and is made with multiple layers of viscoelastic foam reinforced with dense side walls to provide both pressure relief and stability. Designed to be suitable for use with bariatric profiling beds like the Sidhil Bradshaw Bariatric Low Bed, this mattress is suitable for those at high risk of pressure sore development. In order to properly distribute the weight of bariatric users, this mattress is made with multiple layers of viscoleastic foam to provide complex support. It features a 'U' foam construction, meaning that it includes dense foam side walls that increase stability. These side walls also help to facilitate side transfers, while allowing the mattress to retain its shape during and after profiling. In order to protect the integrity of this mattress's foam, it is supplied complete with a waterproof, vapour-permeable cover. The cover is made from multi-stretch PU-coated fabric, allowing it to protect the mattress while remaining comfortable for the user. The multi-stretch material allows the cover to move with the patient, helping to reduce shear and friction forces that can exacerbate pressure sore risk. 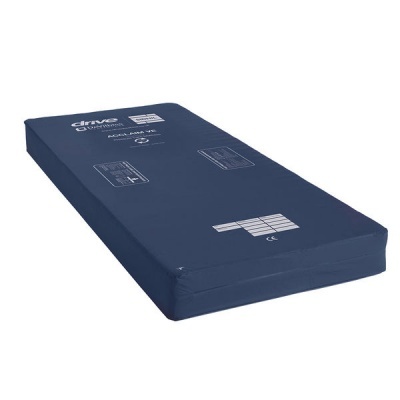 Please be advised that the Sidhil Acclaim Bariatric VE Foam Pressure Relief Mattress is usually delivered between 1 - 2 weeks of your order being placed. We would advise you to consider this delivery estimation before placing your order and apologise for any inconvenience that this may cause. For more information, please contact our Customer Care Team at 020 7501 0592.